Should you be pregnant and planning to visit Gellert Spa in Budapest, this article is specifically for you. Please note that no massage is offered in Gellert Spa during pregnancy. 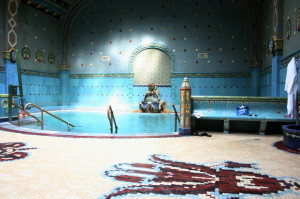 Most of the indoor and outdoor pools in Gellert Spa contain hot water (between 33 and 40 degrees). It is not recommended for ladies who are expecting a child. As for the massages, unfortunately, there is not any thermal baths in Budapest that offer pregnancy massage. The reason behind this is to prevent any potential medical complications that may occur. It does not matter whether you are fit and perfectly healthy with your baby, no management can take any risks of unexpected complications. Thank you for your understanding. In short, massage treatments cannot be booked by pregnant ladies in Gellert Spa. Also, the hot thermal water is not healthy during pregnancy. Please keep consulting with your doctor if you wish to visit any public baths, shared pools while being pregnant and please ask them if you can bathe in the thermal waters. Also be clear whether you need to make any precautions before entering any pools and spas. Visits to the baths and its facilities are at the responsibility of visitors, including ladies who are expecting. We apologise for any inconveniences caused, that we cannot pamper pregnant ladies. However, you will find that some private spas and baths offer pregnancy treatments in Budapest, even if the major thermal baths do not.